Tres Hermanas Farm began in November 2016, through an Office of Refugee Resettlement Grant received by Lutheran Family Services Albuquerque Office. The program aims to connect refugee families with the land, water, seeds, tools and other resources needed to grow food. Tres Hermanas Farm is housed on three separate properties, the biggest and most productive of which is right here on the Rio Grande Community Farm. There are two other small, urban garden plots located in the International District. Our partnership with Tres Hermanas has led to collaborations on workshops, cultural exchanges between refugee gardeners and RGCF community gardeners, increased production on RGCF land, a great diversity of produce being grown on a small area, and now, the organization of another year of the Maize Maze! 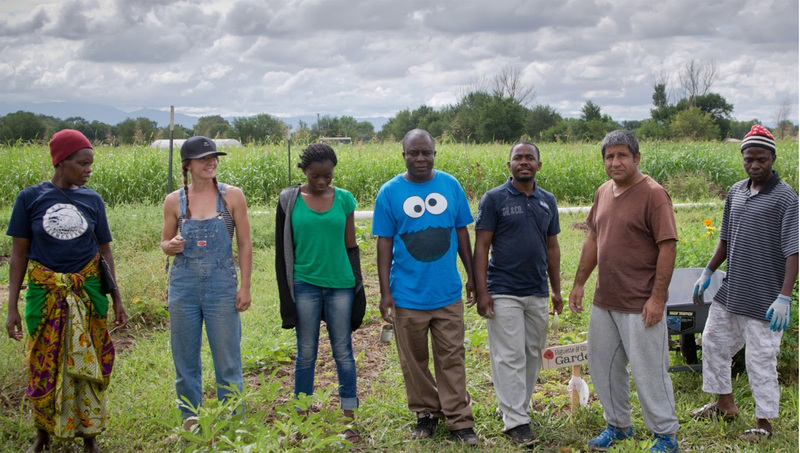 We couldn’t be more pleased having our friends from Burundi, the Congo, Iraq, Afghanistan, and Chad growing food for their families and to sell at farmers’ markets, right here on the RIo Grande Community Farm. Join us for the Annual Maize Maze the last two weekends of October and take a tour of Tres Hermanas Farm! The Maize Maze Presents: Farmstrong Race and Festival! Join us October 27th 2018 for the Farmstrong Fall Festival and the Farmstrong 10k/5k/fun Run! Sign up now to reserve your spot at the Farmstrong Race; run through the golden fields of the Los Poblanos Open Space, enjoy the crisp fall air, and the beautiful migratory birds that spend the winter in our agricultural fields. After the race, explore the 8-acre Maize Maze and engage with the educational activities offered by Explora, the Bio Park and the Audubon Society. Live music will start at 1pm, and Steel Bender Brewyard will be serving in the beer garden all day long. Steel Bender Brewyard will be serving beer! Bluefly Farms will be serving shrubs, sparkling water, and lavender infused treats! Big Jim’s Farm will have pumpkins for sale! Chispas Farm will have veggies for sale! Farm Shark will be selling the finest pickles in town! Help Support RGCF Get Involved! Rio Grande Community Farm is a 501(c)3 non-profit that grows fresh and organic produce, manages a 2-acre community garden with education programming, and advocates sustainable agriculture and numerous initiatives to strengthen Albuquerque’s bonds to its rich agricultural history and quality, healthy, local food. FarmStrong 2017: Fall Festival and 5k/10k Fun-Run! Get the latest updates from the farm in your inbox. © 2019 Rio Grande Community Farm. All Rights Reserved. Site by Mixed Greens Design.